The 2015 e-Golf is Volkswagen’s first all-electric vehicle to be offered in the U.S.A.
Motor Trend has named the Golf family as the 2015 Car of The Year. The e-Golf comes in one trim level, SEL Premium and costs $36,265.00. However, after the government rebate is applied, the cost drops to $28,765.00 including destination fees. What you will get for your money is an all-electric, fun to drive hatchback that has everything that makes the rest of the Golf line such a desirable group. The exterior is virtually identical to the rest of the family. The only hints as to its powertrain being the e-Golf badge on the back, LED headlights and daytime running lights and the lack of a tailpipe. Even the driving characteristics remain unspoiled. Motor Week testers found the e-Golf drove so normally that they nearly forgot it was an electric car. The fun to drive nature is enhanced by 3 driving modes, Normal, Eco, and Eco+, and the added weight of the battery only works to provide a more stable feel. The electric motor produces 115 hp and 199 lb-ft of torque. With a full charge the car can travel up to 83 miles. The EPA-estimated Miles per Gallon of Gasoline Equivalent (MPGe) for the e-Golf is 126 city, 105 highway, and 116 combined This efficiency brings the e-Golf to the top of its class. 1. The standard charging cable can be plugged into any 110/120 volt receptacle and will take close to 20 hours to fully recharge. 2. A 240 volt wallbox will use the full 7.2kW capability to charge the battery in under 4 hours. 3. The standard equipment, Combined Charging System (CSS), grants use of the SAE DC fast charging stations. These stations deliver 50kW and will bring the battery up to an 80% state of charge in just 30 minutes. No matter which method you choose, you can rest assured that it will be much cheaper than fueling a traditional combustion engine. Even with the large battery residing below the occupant space, the e-Golf retains exactly the same interior volume as other Golf hatchbacks. The interior offers 93.5 cubic feet. 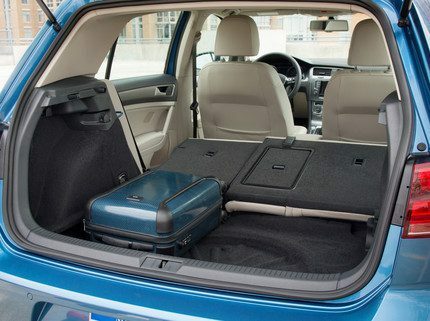 It also retains the Golf’s versatile cargo area that provides 22.8 cubic feet of space behind the rear seats and 52.7 cubic feet with the seats folded. 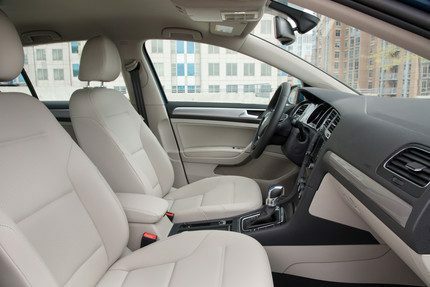 The use of premium materials and the solidly built feel of the interior are typical for Volkswagen, and the e-Golf follows suit. 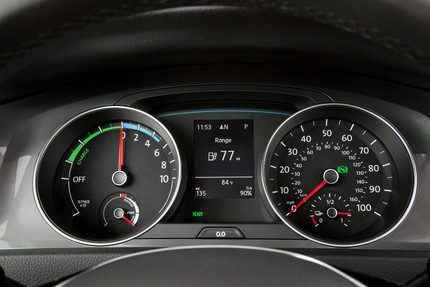 The dash layout is driver centric, and features easily understood gauges including a battery charge gauge that resembles and functions just like a typical fuel gauge. The tachometer has been swapped out with power display. This gauge will indicate whether the motor is ready, if the battery is being recharged (via regenerative braking), or if power is being drawn off. It will also show the amount of available output. By keeping the core values of the Golf family and offering great daily functionality and comfort, the e-Golf adds yet another reason to look twice at the Volkswagen Golf line.